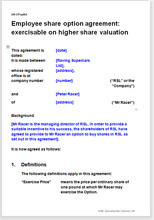 Use this agreement to grant a share option to an employee based on an increased valuation of the shares. He may be employed in any capacity. Suitable for any business. The conditions to trigger option to be entered by you. Example given. This document will be bought by any company to set up a motivational option scheme for an employee working in any capacity. It is assumed that the employee will achieve some goal or target to qualify. The option is triggered by the increase in the value of the company calculated as set out either in the agreement or in a schedule. The terms are for you to decide. We have provided an example deal, but it is for you to enter details of your exact deal. That may be any arrangement you like. The actual result or event which will trigger the exercise of the option is for your commercial judgement. If there is no decisive event which proves the increase in value, you may need to ask your accountant for a suggestion, with reference to balance sheet value or profit as shown on the annual accounts. This would also be a good time to put into place a new shareholders’ agreement whilst you are in charge of the shares. If you wait until the optioner is a new shareholder, you will have to take greater account of what he wants. Look at Shareholders' agreements. This document is drawn under basic contract law: no special rules, no tax arrangements, no complications. The law which is followed is of Companies Act, 2008,.